The big problem with steam as a source of energy is that the output of a boiler is erratic. The amount of steam that comes out (the energy available to you) depends on the weather, the temperature, how much fuel is in the system, how much water, and myriad other factors. When you’re trying to run a machine, erratic power is near-useless and potentially very dangerous. In 1788, James Watt solved part of the problem by putting a centrifugal governor on his steam engines. It works like this: part of the power of the engine is diverted to spin a device with two arms connected to weights. 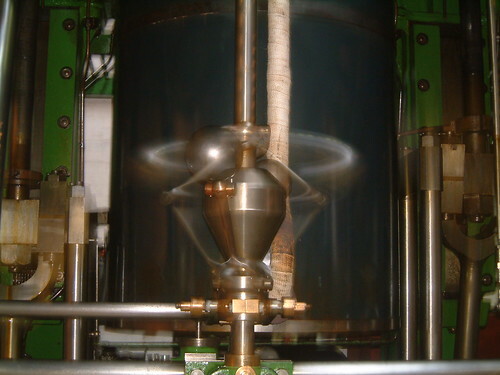 The arms are in turn connected to a valve which controls how much steam is allowed to pass through. When there is more power, the governor spins faster, which makes the weights fly out, which moves the arms, which narrows the throttle-valve. When there is less power, the spinning slows, which makes the weights fall, which widens the valve again. The weights quickly reach an equilibrium and the output remains constant. Look at what’s happening here: steam energy is being converted into information which controls a feedback mechanism. The whole system is regulated through a kind of limited self-awareness built right into the machine. James Watt’s highly efficient steam engines are credited with being at the cornerstone of the Industrial revolution in England. Centuries later, the use of the centrifugal governor would be seen as a kind of early cybernetic device.